Grace is one of the most successful businesswomen in West Africa. She has become a powerhouse in the booming beauty & skincare business, but her mission statement is different from most. While the majority of skincare products promote a Western look and lighter skin tones, Madam Grace has built her empire on celebrating the natural beauty of dark skin. 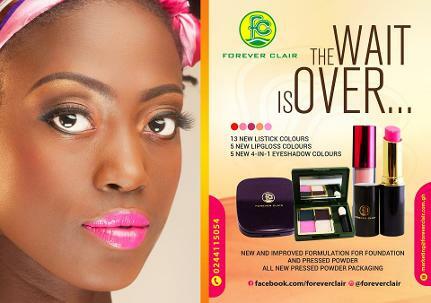 Having received education into Beauty Therapy at Croydon College, London, she returned to Ghana to attempt to start her own beauty business. Working out of her bag rather than an office, she went from door-to-door offering skincare advice. However, it didn’t take long for Grace to come to the realisation that skin-bleaching/lightening was a rife practice being done at an alarming level. And not only that, but that “the women…had destroyed their skin with all these kind of beauty products, bleaching products”. This created a resolve to assist African women in reversing the process and to help celebrate dark skin “otherwise it would become a social problem.” This resolve pushed her to open her first beauty clinic, a small venture funded with help from her family. This business which started with £63 now has an annual turnover of approximately $10 million! 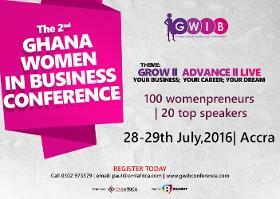 Grace is Keynote Speaker at the second Ghana Women in Business & Leadership conference. Her topic: "How to Run a Successful Family Business-the FC Model"
Anita is the founder of GWIB and the CEO of OML Africa. She is passionate about Ghana, its community and supporting other women in their business endeavours and her enthusiasm and energy pervades every activity she embarks on to do with women and business. Her topic: "Cost-Saving Strategies for Your Business"
She is also a business news anchor and host of Business Today, a consumer focused show on the network and Business Weekly. She is the business voice on the business news bulletins on Citi FM. In 2013, Vivian was adjudged the overall Business Journalist of the year for radio in Ghana. Citi FM was adjudged best business radio station in 2012 and 2013 under her leadership. She was also nominated for the radio newscaster of the year category in the 2014 Radio and Television Personality Awards (RTP). Vivian was the only Ghanaian journalist nominated by the American Embassy to cover US President Barack Obama’s hosting of 50 young African leaders and subsequently African heads of state in Washington. She was also nominated to cover the Global African Investment Forum in the UK in October 2014 which was hosted by Prime Minister David Cameroon and the Daily Mail. Multinational companies like Standard Bank in South Africa, MultiChoice Africa etc have invited her to cover their annual general meetings and other important gatherings in South Africa, Mauritius among others. Backed by Rocket Internet, MTN and Milicom. Jovago.com launched operations in 2013 in Nigeria and since then has also opened offices in 12 Sub-Saharan Countries. Currently, company offers more then 200,000 hotels in 211 countries around the world including over 20,000 hotels in Africa. Claire Staal worked for big hotel chains like Starwood and Hilton Worldwide before she started as Head of Business Development with Jovago Nigeria. Because of her hard work and successes she was promoted as Managing Director in Ghana and launched the brand in the beginning of July 2015. Claire is an example of somebody who works hard and enjoys her life the fullest. In her free time she loves to dance Salsa and Kizomba." Nandimobile, which seeks to make relevant information from businesses and organizations easily accessible on mobile phones, were winners and champions at the World Summit Awards 2013 in the eBusiness and commerce category. She recently started MySMEPortal to equip SMEs to run sustainable and profitable businesses by matching them with the right tools,mentors and investors via an easy-to-use cloud-­based portal. Anne holds a BSc in Computer Engineering from Kwame Nkrumah University of Science and Technology in Ghana and is a mentee of Fortune/U.S State Department Global Women’s Mentoring Partnership .She enjoys empowering young women through mentorship. He is a certified professional digital marketing strategist, social media coach, technology consultant, facilitator and columnist. He has practical experience in advertising, digital marketing, social media, web/app development and events. He has worked for both local and multinational brands over the years. He is a highly sortafter facilitator for business technology events, workshops, and seminars. He speaks on topical technology-industry issues with special focus on the business of technology at technology and business events. Some of his past many speaking engagements include: MTN Digital Media Workshop; MTN App Challenge; Festival Of Ideas, Ghana's Premier Business Gathering and Conference organized by Legacy & Legacy Ghana; Springboard Road Show organized by Legacy & Legacy Ghana; Joy Technology and Innovation Summit, organized by Joy99.7FM; Mobile Monday organized by Ghana-India Kofi Annan Centre of Excellence in ICT; MTN App Challenge organized by MTN Ghana; MTN YClick Youth Career Development organized by MTN Ghana. His topic: "Leveraging Social Media to Drive Real Results"
An experienced trainer in leadership and personal development and a ‘Serial Entrepreneur’ with an academic background in Positive Leadership and Strategy, Afua has a25-year Management experience, working in a variety of corporate environments. Afua, is strongly committed to people development. She offers training, coaching, mentoring and custom solutions to business leaders, entrepreneurs, consultants, speakers and trainers. Afua has an MA in Positive Leadership and Strategy from IE University in Madrid, Bachelor of Laws (LLB) from KNUST, Ghana, MSc, Organisational Development from the University of Cape-Coast and MBA International Business from EcoleSuperieur de Gestion (ESG), Paris. She also has an Advance Leadership Training Certificate, Strategic Marketing Management from the Harvard Business School, Boston, a Post-Graduate degree in Communications Studies, School of Comm. Studies, University of Ghana, Diploma in Public Relations and Advertising, Ghana Institute of Journalism and currently pursuing a Doctoral degree in Business Management with the Swiss Business School. Lucy is an international business leader who passionately believes in harnessing the potential of people to deliver outstanding results in business and society. She is the CEO of Airtel - Ghana’s fastest growing Telecommunications Company. Lucy has a reputation for turning around businesses for growth and positive reputation even in the most challenging situations. Since taking over Airtel Ghana, Lucy has successfully repositioned the company into the fastest growing telecom company growing customer market share for both voice and data consistently ahead of industry average. She has transformed Airtel into the most loved telecom brand in the daily lives of Ghanaians. Her vision asa business leader is clear, build great business through great teams as this creates good for all stakeholders. She has led Airtel Ghana to win more than 20 prestigious awards in two years including: Best data and internet service provider at the Ghana ICT and Telecom Awards (GITTA 2016), Marketing Campaign of the Year (GITTA 2016), Telecom Brand of the Year (GTA 2015), Innovative Enterprise Product of the Year (GTA 2015), Best Organisation for Learning and Development (HR Focus Awards 2015), CIMG marketing oriented company of the year (2014), Best CSR company for Education (Ghana CSR Excellence Awards 2015) and Best CSR Company of the Year (GTA 2014). Lucy's topic at GWIB 2016 "'Breaking the Glass Ceiling, My Story"
Afia is a popular face on the national television station ( GTV) breakfast show and other television stations as a resource person on counselling related issues. She is a UK professionally trained counsellor/ Therapist. She is also the executive director for Open Door Counselling Services and a consultant to some international schools in Ghana for counselling related issues. She is also a motivational speaker who is mostly invited to speak at conferences, Seminars, Schools, Churches and other Associations. Dr. Welbeck has over two and half decades of experience in labour-management relations having started her working life with the Ministry of Labour where she worked for a decade and half before joining the National Labour Commission from 2005 to date. At the Ministry of Labour she worked with several Ministers of Labour and served on various Labour Committees including the National Tripartite Committee and the Tripartite Technical Committee that drafted the Labour Bill, which was later passed into the new Labour Law - Labour Act, 2003 (Act 651). She was instrumental in the establishment of the National Labour Commission (NLC) and was thus appointed as the first Head of Administration and then as the Director of Administration and Human Resources. She also served as the Acting Executive Secretary (CEO) of the NLC for one year and three years respectively. Dr. Welbeck is an international speaker as well as a public speaker who has presented Papers on Labour Relations both nationally and internationally.She has trained professionally and variously with international institutions like the International Training Centre of the International Labour Organization (ITC-ILO), Turin, Italy; Federal Mediation and Conciliation Services (FMCS), USA; the National Labour Relations Board (NLRB), USA; the United States Department of Labour ( USDoL), USA; and the Hachioji International Training Centre of the ILO, Japan, among others. Dr. Welbeck is an Adjunct Lecturer in Graduate Studies at the Ghana Institute of Management and Public Administration (GIMPA) and the Central University College (CUC) where she lectures Industrial Relations and Negotiations & Conflict Resolution. She is a Training Facilitator in Human Resources/Human Capital Development and Management Development Programmes. She consults both nationally and internationally and has consulted for some international institutions, amongst which are the Social Protection, Governance and Tripartism Programme Desk of ITC-ILO, Turin-Italy and the Intelligence Training Centre (ITC) of South Africa. Renowned actress, TV personality and life coach. 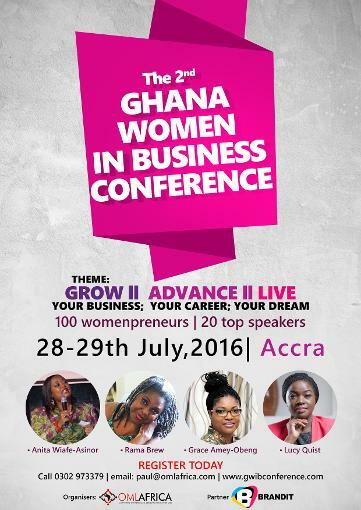 Rama is speaker at the 2nd Ghana Ghana Women in Business conference this July! She will speak on the topic "Your Personal Development and Your Business"
Petra is an emerging corporate leader in Ghana. After working in the airline industry for close to a decade, she has recently taken up a role as Head of Station for one of Accra’s newest radio stations – 3FM 92.7. Petra is a Chartered Marketer by profession with a Post Graduate Diploma in Marketing from the Chartered Institute of Marketing, UK and holds a first class Bachelor of Arts Degree in Political Science with Philosophy from the University of Ghana, Legon. She teaches marketing on a part time basis at the Simon Page School of Marketing. Her topic:"Mum, Mama. Mommy. Ma"
Chief Executive Officer and founder,Self Search Ghana Ltd. Joyce is a certified International Gestalt Practitioner with the Gestalt Institute of Cleveland with a combination of twenty–six (26) years professional experience as a trained educator and educational psychologist, guidance counsellor, corporate trainer, career consultant and human resource practitioner. In the last six (6) years, Joyce has developed and facilitated different Corporate Training and Coaching Workshops in numerous companies and institutions on areas including Team Building, Differentiated Instruction, Coaching and Mentoring, High Performance Behaviours for Corporate success, Effective Customer service among others. Joyce has further assisted in the career development of thousands of individuals. Her topic: "Discovering and Embracing Your Authentic Self"
Mabel Simpson is the Founder and Creative Director of mSimps, an award winning accessory manufacturing company and creative enterprise in Accra, Ghana. mSimps focuses on handmade handbags, slippers, laptop bags and other leather accessories and home décor with the primary goal of projecting Made In Ghana products and fashion. Her topic: " From Start Up to the World"
Founder & CEO of Green Trek Tours and Customer Service Africa. Priscilla is a well experienced and results-oriented individual who has obtained significant recognition and achievements over a nine years period of her a professional career till date. A relentless individual who thrives on achieving success irrespective of impediments, and whose professionalism is built on key tenets of excellent customer service, passion, commitment, dedication and a can-do spirit. She has trained over 100 professionals and lectured in various customer service boot camps. An expert in hotel service delivery and an efficient front office management that maximizes returns/sales for hotels/organizations, with extensive success in organizing tours, conducting training into customer service, hotel booking and youth motivation. Priscilla is a panelist on the Business Clinic at this year's conference.